Welcome to Bel Canto’s 86th season! We are embarking on a five-year journey to our 90th anniversary. Each of the next four seasons will lead us to our final destination in our 90th year, with each year building on the last. See if you can piece the puzzle together and discover what our journey is about! This Awaken Within season will be an emotional voyage that will feed your soul and awaken your inner being. We have planned each concert to spark emotions that move you and bind us all together. 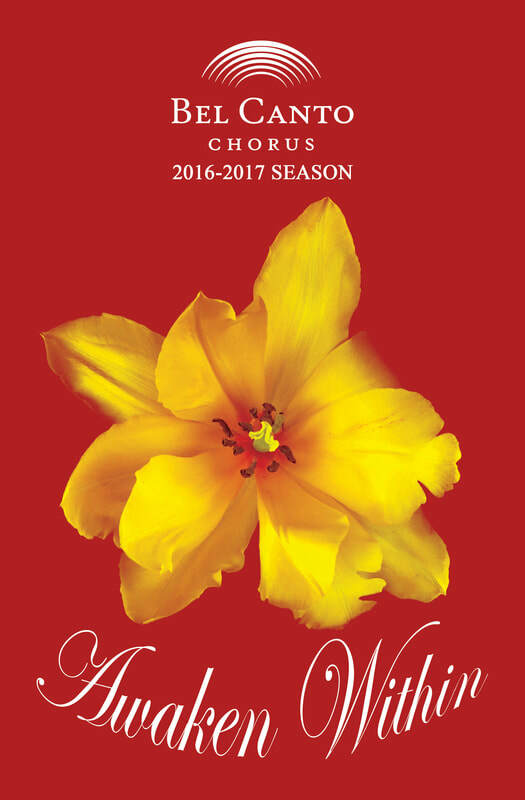 Our concerts include Peace & Awe in October, Joy: Christmas in the Basilica in December, Conviction in March, and Spellbound in May. In addition, we invite you to our free concerts offered throughout the season by the Bel Canto Boy Choir and Bel Canto Senior Singers groups to enhance your overall experience. We cannot wait to share this positive and captivating season with you. Please join us to experience a true awakening! Peace: freedom of the mind from disquieting or oppressive thoughts or emotions; mental calm, serenity. Awe: a feeling of reverential respect mixed with fear or wonder. We will be featuring one of John Rutter’s masterpieces, his Requiem. Written after the death of his father, this work takes the listener from the sorrow of loss to the consolation, reconciliation, and ultimate joy of resurrection. Rutter’s tender and moving Requiem has earned its reputation as one of the most popular choral compositions of the last 40 years. Along with works by two of America’s emerging choral voices, Dan Forrest and local composer Penny Corris, the words and music of hope and assurance will take you to a serene and tranquil state of mind. Joy: a feeling of great happiness. This ever-popular event, named to the Milwaukee Journal Sentinel’s “Fifteen Top Holiday Concerts in Milwaukee” list in 2015, will once again fill the Basilica of St. Josaphat. Performed by Bel Canto and accompanied by Kevin Bailey on the organ and Stained Glass Brass, this year’s concert includes the premiere of a work by Christian Ellenwood along with the traditional carols and songs of the season that people have come to know and love. Make this annual experience part of your holiday tradition. Experience Felix Mendelssohn’s iconic oratorio Elijah, a story of faith, despair, and renewed belief. First performed in 1846, it is considered one of Mendelssohn’s most famous works. Influenced by the choral masterpieces of Bach and Handel, Mendelssohn composed a highly dramatic and romantic recount of the prophet Elijah, whose deep confidence in his Lord resulted in victory and reward. Experience for yourself the powerful and sublime nature of this 19th-century work that continues to capture the imagination of audiences everywhere. Spellbound: bound by or as if by a spell; enchanted, entranced, or fascinated. Join us as we present the Wisconsin premiere of Kile Smith’s fresh, richly emotional new piece, Canticle. We will complete this mystical, moving concert with several pieces by Latvian composer Ēriks Ešenvalds. Their music is astoundingly beautiful, breathtaking, and ethereal. The emotional setting of text and dense, luscious writing will elevate you. Come see our talented group of boys and young men perform. This program provides a safe and supportive environment for boys in grades three through twelve to enjoy their singing experience while growing musically and socially within their own peer group. (BC)2 has planned one free performance with others to be announced during the season. The goal of this program is to bring the physical, emotional, and social benefits of group singing to those in the community age 55+. Between our two groups, there are four fabulous and free concert opportunities available each season. Both concerts will be at the O’Donnell Room at San Camillo Retirement Community (10101 W. Wisconsin Ave., Wauwatosa) with a free reception following each concert. Both concerts will be performed at Holy Apostles Catholic Parish (16000 W. National Ave., New Berlin). The 6th Annual Tribute to Dr. Martin Luther King, Jr.
Join us as we raise our voices with friends of Bel Canto to celebrate the life and legacy of Dr. Martin Luther King, Jr. We are still working on making this concert the best yet, so stay tuned for further information on date, time, and location.